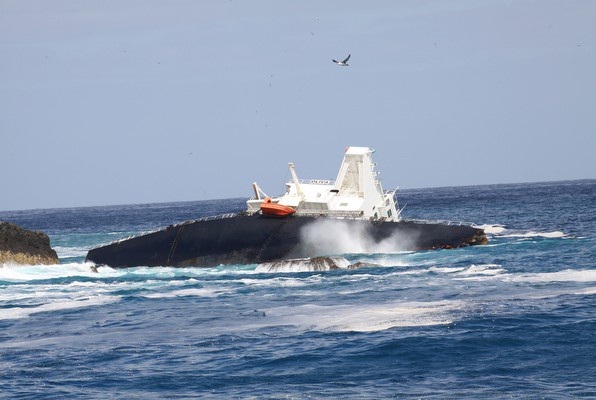 At about 0510 (UTC) on 16 March 2011, Oliva, a Maltese registered bulk carrier ran aground on the north-west coast of Nightingale Island in the Tristan Da Cunha Group. 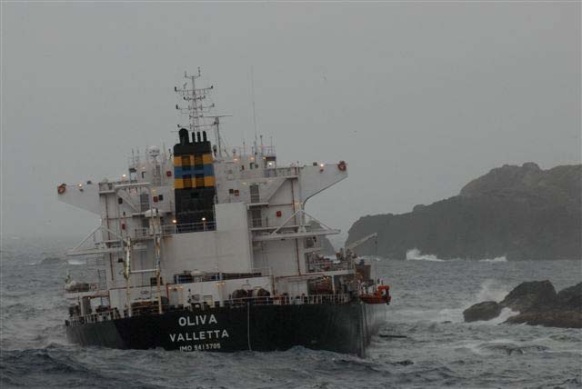 Oliva was on a loaded passage from Santos, Brazil to China. The vessel sustained severe bottom damage to almost all of her water ballast tanks that resulted in the vessel developing a 12º list to port. The location of the grounding. At 2345 on 15 March, the second mate arrived on the bridge. The port radar (S-band) was in use and had been set up in relative motion, north-up mode. The heading marker was off centre resulting in an increase of range of 17 nautical miles ahead. The second mate read and signed the master’s night orders and thereafter took over the watch from the third mate. The master was also present on the bridge but left after 5 minutes of the second mate taking over. On 16 March, at 0340, the second mate called the chief mate for his watch. The 0400-0800 lookout arrived at about 0355 and took over his lookout duties from the 0000-0400 AB. Just after 0400, the second mate noticed a large defined echo on the radar screen, about five nautical miles and passing clear down on the vessel’s port bow. The second mate assumed that it was either rain clouds or an iceberg; he thought that the vessel was within the limits of icebergs according to the routing chart he has seen. At 0410, the second mate made another call to the chief mate as he had not arrived on the bridge. The chief mate arrived on the bridge at 0420. The second mate handed over the watch as the chief mate stood in front of the bridge window next to the location of the VHF radio. He advised him of the course set on the autopilot, which was 107º. Thereafter, the second mate left the bridge at about 0425. He did not tell the chief mate of the radar echoes he had noticed earlier, as they had passed clear of the vessel and he did not tell him that the vessel would be passing close to land during his watch. The chief mate then sat down on the pilot chair located next to the radar in use. He recollected observing some fuzzy echoes which he thought were scattered rain showers. The starboard bridge door was open and the bridge window wipers were switched on because of rain. There was no indication that either the second mate and later the chief mate switched to the X band radar when they were approaching land or when they were expected to make landfall. At about 0430, the AB reported sighting a white light forward of the vessel’s port beam, which he assumed was a fishing vessel. The chief mate responded that he could see it but did not get up from the chair to investigate it. At 0500, the AB entered the chartroom and plotted the vessel’s position. 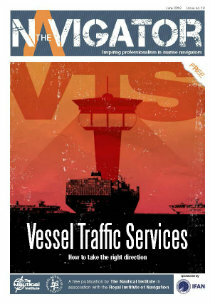 He noted that the position was on the course line and that the heading marker on the radar display was on the red course line indicating that the vessel was on track. Just after 0500, the chief mate went to the chartroom and noted that the AB had plotted a position on the chart. He returned to sit on the pilot chair and noticed a large echo on the radar screen, very close ahead. He assumed it was a heavy storm cloud and thereafter, he felt the vessel’s impact of running aground. The chief mate moved to the steering position and noticed that the vessel was turning to port. He switched over to manual steering and attempted to use the wheel. The ship started to develop a port list and the chief mate and AB could hear the sound of escaping air, presumably coming from the ballast tank vents. The vibration of the vessel running aground and the change in the main engine noise woke up most of the crew, including the master. The master noted the time as 0510. The vessel ran aground close in to a rocky shore beneath low cliffs. The first person to arrive on the bridge was the master followed by the third mate and then the second mate. The third mate put the engine telegraph to stop. The master found the chief mate and AB on the bridge but neither could offer any explanation as to what had happened. The vessel developed a port list of 12º and assumed a heading of 091º. The master ordered the second mate and chief mate to take soundings of the ballast tanks. The third mate plotted the position of the ship which placed the vessel on Nightingale Island, one of the three large islands that forms the Tristan Da Cunha Group. The chief mate soon reported to the master that all the double bottom tanks (nos. 1 to 4) on the port side were full as well as double bottom no. 1 starboard. Sometime later, he also advised the master that the forepeak tank had a sounding of 10.4 metres. The chief engineer reported that all fuel oil tanks were intact. At 0530, the master informed the company by e-mail giving them the time and position of grounding. This was followed by a satellite telephone call to the operations manager. At 0720, the master received a VHF radio call from the Tristan Da Cunha Administrator requesting details of the incident. As it became light, the master instructed the crew to don lifejackets, prepare the rescue boat and lower the vessel’s free fall lifeboat into the water using the davit. This was done and the lifeboat manoeuvred and secured alongside starboard side of cargo hold no 7. Initially, 12 crew members were transferred across to the fishing vessel Edinburgh, that was standing by to render assistance. On 17 March, the weather deteriorated and the remaining 10 crew abandoned the vessel. On 18 March, the vessel broke up in two sections; the forward section drifted away and the aft section capsized and sank. All this resulted in wide spread pollution around the islands of Nightingale and Inaccessible because of the diesel and fuel oil that escaped from the vessel’s fuel tanks. 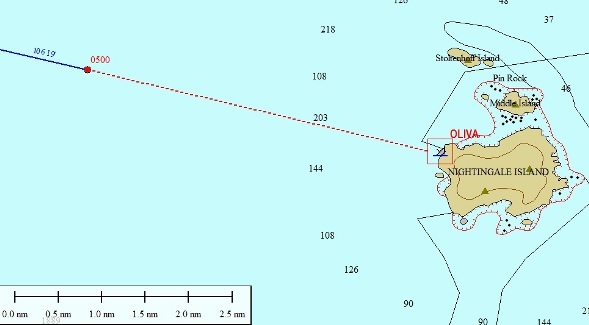 The investigation found that the vessel was following a great circle route that took the vessel directly over Nightingale Island. One of the navigational officers of the watch had made an error in plotting one of the way points the vessel had to follow. This resulted in a course line, which indicated that the vessel would clear the group of islands by about 10 nautical miles. The navigational officers of the watch (OOWs) was not using an appropriate large scale chart for that area and the plotting sheets in use did not show the islands ahead.